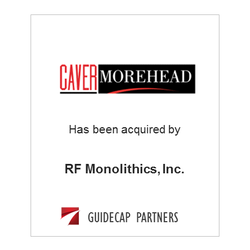 Caver-Morehead Systems, Inc. has been acquired by RF Monolithics, Inc. The acquisition combines Caver-Morehead’s computerized maintenance management systems with RF Monolithics’ low power wireless machine monitoring products. ​GuideCap initiated the transaction and acted as financial advisor to Caver-Morehead.